Welcome to this beautiful house with capacity for 10 people, located over the cliffs of Cala Serena (Felanitx) where you will be able to admire the best sunrise in Mallorca. Bungalows Playa d'Or - 1 room apartment. Our apartments are situated in the most beautiful bay, at the "Cala Gran" - with direct access through our garden for swimming on sandy and rocky beach. 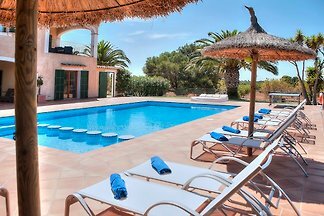 Close to Cala Mitjana and Cala Sa Nau, this cottage features a private pool and can comfortably accommodate 10 - 12 people. Comfort - Finca Casa Sanau 5208 with pool and a blooming garden near the beach (750m) with 6 bedrooms, 6 baths, Internet, dishwasher, washing machine and air conditioning. The luxurious Finca Gatona is situated on the outskirts of Cala D'Or, on the island of Inselsüden. The sea is only about one kilometer away from Feriendomizil. 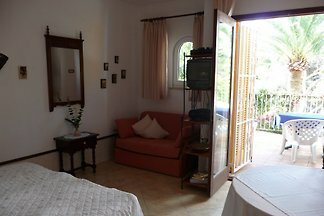 Comfort - Holiday home Casa Sanau 2210 with pool and blooming garden near the beach (800m) with 2 bedrooms, 2 bathrooms, internet, dishwasher and washing machine for 4 people. Exclusive accommodation decorated in Ibiza style with capacity for 8 people, which counts with a fantastic garden and swimming pool area. Beautiful Mediterranean-style villa in Cala Egos, welcomes 6 (+ 1) guests. Welcome to this great house with shared pool and near the beach in Cala D’Or. It has capacity for 6 + 4 guests. This modern finca with private pool in S'Horta, just 4 km from beautiful Cala Ferrera with fine sand, offers a second home for up to 7 guests. Rent successfully your holiday flat or holiday home in Cala Ferrera in only 20 minutes !